Regional products available right now! Check the list on the right to see what products and other fresh items are in season and ready for sale at your local, North East Alberta, producers and retailers. Available at EMJAY’s Prairie Berries starting July 09, 2017. Here you will find an abundance of regional food producers and processors that can supply you with natural food products for your family. Our association is using a Trade Marked Regional Brand to help you identify the regional products you are seeking. This brand will be your assurance that the products you purchase from our members are really from this region. Our web site is full of resources including a full members directory, with locations and details about each member. Our Investment Attraction & Retention Toolkit features the most comprehensive aggregation of resources for both existing and new businesses anywhere on the web. Plus, we’ve just added local recipes so you can enjoy the bounty of Alberta’s Northeast Region right in your own home. Explore each Town & County in our region and find out more about Agrifood Producers, Processors, Retailers and Distributors. Navigate all our great resources and information online, or download the PDF, formatted for plain paper so you can create the hard copy right on your own printer. The PDF download features the highlights of our Toolkit including data, statistics and resources. For all available information, please continue with the online version. 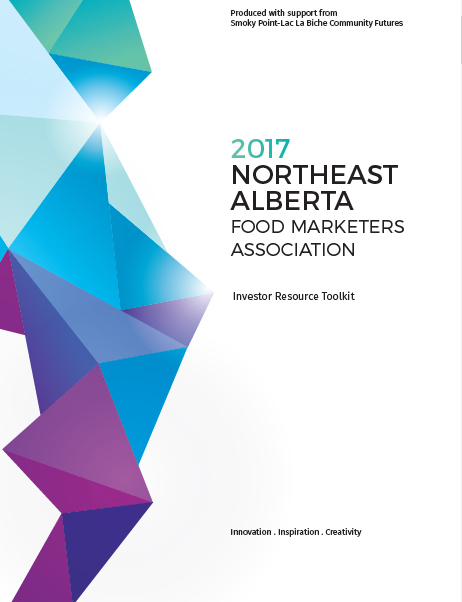 The Northeast Alberta Food Marketers Association was incorporated on October 6, 2010 as a not- for- profit association. It is a coordinated effort to ensure that Local Food is readily available to the consumers of the region. We want to ensure that the skill of food production is not lost. We encourage acreage production that can possibly provide a primary or secondary income for the producers. To increase awareness and use of the regional food processing facility located at Portage College. This small batch Food Sciences Centre serves both the students of the College and entrepreneurs in the food sector. Our effort will address demands from consumers that are increasingly wanting to know where their food comes from. The Association has worked with Community Futures St Paul – Smoky Lake Region to develop a regional Brand that is Trade Marked and owned by Community futures for the time being. The Brand is a regional identifier only, it does not offer quality guarantees of any kind. Users must sign a license agreement to use the brand. In it they agree that the products being branded were produced, grown or processed in this region. As a consumer we encourage you to view the producer and processor pages as well as the marketers page. Here you will find the Agricultural Products being provided and how to find them. Our association has been approved to use the Trade Marked Regional Brand that is owned by Community Futures St Paul – Smoky Lake Region. 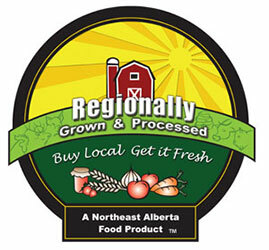 A brand that identifies the Northeast Region of Alberta and its abundant supply of locally grown, raised and processed food. A Campaign to help people make an informed choice when purchasing food for their family. A diversification project that encourages small scale food production at the regional level with the hope that they will support a Regional Food Processing Facility. © 2019 Northeast Alberta Food Marketers Association. All Rights Reserved.